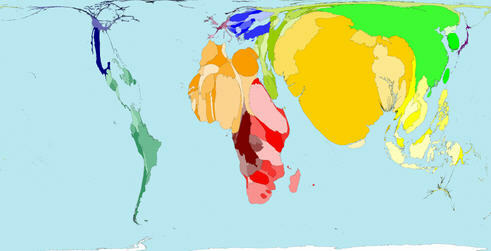 Image above: A cartogram from the Worldmapper site. Worldmapper is a collection of world maps, where territories are re-sized on each map according to the subject of interest. These types of maps are called Cartograms (equal area cartograms, otherwise known as density-equalising maps) and are a way for us to see the differences across the world in terms of an unlimited number of social, economic, cultural and geographical criteria.There are now nearly 700 cartogram maps on the site that you can explore. Your task is to pick just 10 maps that interest you and write a brief summary of what the map shows.